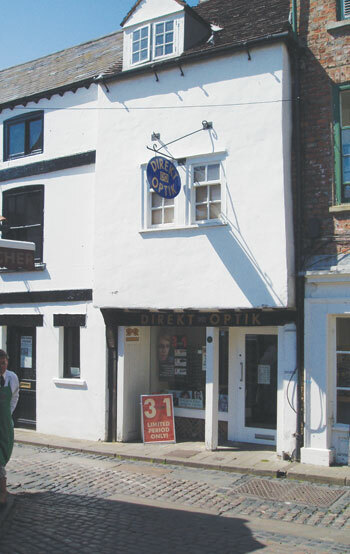 Extensively restored in 1974, it is probably the second oldest dated house in York. The range Nos. 12 to 15 Newgate represents the surviving units of a row of timber-framed houses built in the churchyard of St. Sampson in 1337, facing south-east along Newgate. Angelo Raine in his Medieval York says that before 1336 the churchyard stood on the north side of the street, and it was about that time that Sir Hugh Botner, chaplain, of York, was granted a licence to build houses on part of the cemetery along the street called Le Newgate. The block ran 130 feet in length and was 20 feet deep. 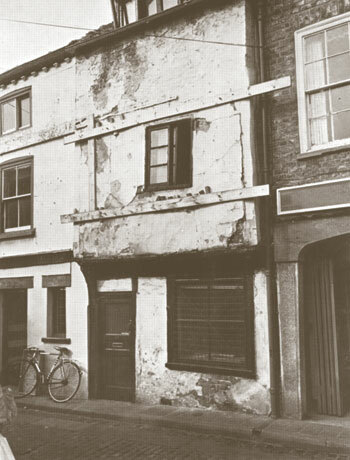 Some idea of the property in its original state may be had from an examination of the houses in Lady Row, Goodramgate, probably the oldest domestic buildings in the city. No. 12 represents one original tenement, of which there were originally ten or twelve, each self-contained with one room upstairs and one down. The upper room would be open to the roof. No. 12 was heightened in the early nineteenth century to create an attic and all the windows are modern. If No. 12 is a typical example, each tenement was entered by a doorway at the north-east end of the front wall and a straight, steep staircase along the internal north-east wall led to the upper room. A large seventeenth century chimney breast was recently removed from the south-west wall. At the front, the south-west corner posts remains supporting the ground floor wall-plate. The first floor is jettied and retains its timber framing. 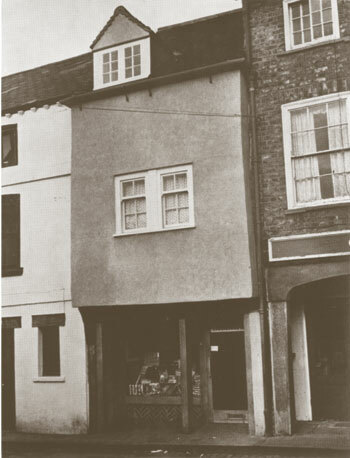 During renovations in 1974 the ground floor front wall was removed below the wall-plate and a new shop front created. Inside, partitions and staircase were removed and the ground and first floors made into a single room each. An open spiral staircase runs from ground to second floor. All the timbers have been exposed and cleaned, and some have been replaced by new or resited old ones. An interesting survival of fourteenth century houses which supported, with their rents, a chantry in honour of the Blessed Virgin Mary in nearby St. Sampson’s Church, which is now put to admirable secular use as an old people’s centre after extensive renovation.